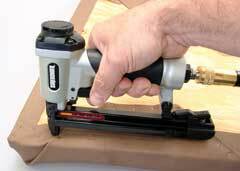 Staple guns are useful for wallboard, wiring, plumbing and other projects, and a good staple gun can be used for additional work such as furniture building and woodworking crafts. Pneumatic guns are probably the best staple gun type to have in the garage or shop and work the same way as a brad nailer. However, there may also times when you need something that you can exert a little more control over. In those cases, you need an old fashioned, heavy duty, manually operated tool. If you want to have a complete tool collection, you’ll find that an air compressor staple gun backed up by the smaller manual version is the best way to go. Here are some options we recommend. Made in the USA, Surebonder tools and adhesive products are popular among woodworkers and other craftsmen. The Surebonder 9600A is designed for use in flooring, framing, and in finer woodcrafting projects or as a general tool around the home. It accepts compressed air pressures between 60 and 100 psi, and the quick release magazine will hold a maximum of 100 staples when full. With a uniquely designed drop-load cartridge, loading staples is fast and easy, and there is a patented safety lock to prevent accidentally shooting yourself while working. Weighing only 3 pounds, this staple gun is well balanced and has a visually pleasing ergonomic design that reduces muscle fatigue. Although the company is not as well known as some tool makers, Surebonder has a long reputation in the field of fasteners and adhesives, and is the manufacturer of choice for woodworkers, trim contractors, and more. There is not much to complain about with the Surebonder 9600A, but be sure your compressor is up to the job of supplying dependable air pressure or you may experience poorly set staples or machine binding. An excellent contribution from American-owned Bostitch, the Bostitch T6-8 is a manual staple gun that stands apart from the crowd. Designed with an easy pull trigger, this lightweight tool works great for everything from carpeting and crafting to putting up your Christmas decorations, replacing window screens, and more. For those with a weak grip, it may be important to note that this tool, like all manual staple guns, requires a minimum amount of squeeze pressure in order to operate. If you have trouble gripping and squeezing, it may be best to look at a pneumatic staple gun to compensate for you. On the opposite end of the spectrum, some users have reported that that staples were ejected with too much force, causing minor damage to the materials being worked. 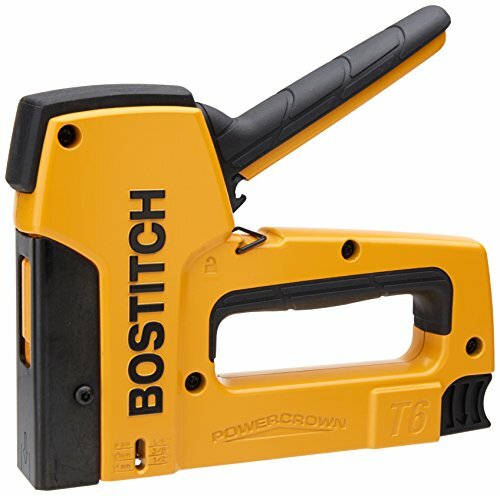 Aside from those complaints, a Bostitch T6-8 is made of high quality materials and can be used for stapling just about anything. Most Stanley products are manufactured in the USA, but the TR250 SharpShooter is an exception. Even so, this tool is manufactured in Taiwan (much higher quality than Chinese made counterparts) and built to meet manufacturer specifications. The aluminum body is lightweight, so you can use it for hours, and it’s designed with a light trigger mechanism that allows you do more, even if you are not able to squeeze with as much force as you once did. Something innovative for a staple gun, this model includes a high and low pressure switch so you can control how much force is being used for the delivery. This is a great idea for those times when you’re working with wires or easily damaged materials. To help you use the right staples for the job, there is an EZ-View window to identify the fasteners installed and keep up with when to refill the magazine. The most common complaint associated with this model is that the staples do not always sink flush with the material, but this problem may be the result of using the tool in the wrong pressure setting, or even simple inexperience with the use of staple guns. 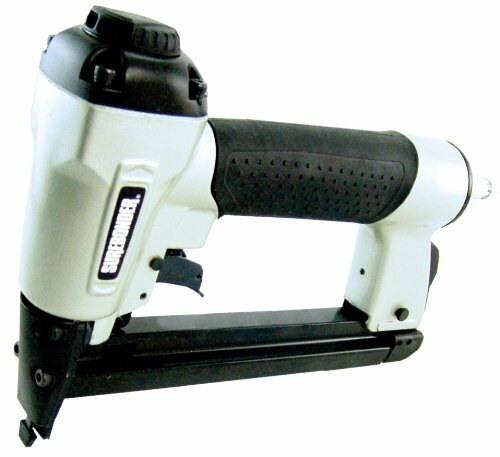 I have used some of these staple guns but the Surebonder 9600A staple gun is very good. I like the features and also just by looking it, you can tell it’s more comfortable to use it. Thanks for the info. 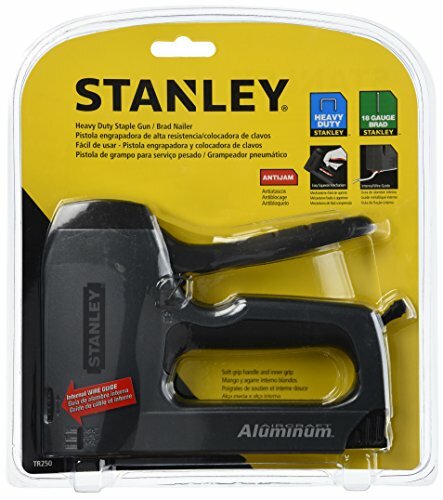 It’s crazy how cheap staple guns (air powered) have gotten. My Bostitch compressor included a free one but even your top pick is only a few dollars more than a manual gun. I’m fairly “old school” but pneumatic is better in this case.